The Five Elements are assigned to each directions on a Ba Gua. 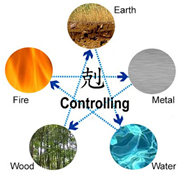 To better understand the application of Ba Gua in Feng Shui analysis, we need to understand the cycle of these Five Elements: Earth, Metal, Water, Wood, Fire. 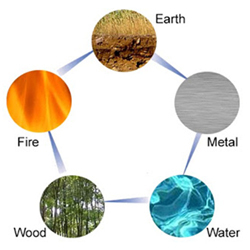 The Five Elements represent five phases or transformations of energy and can also simply represent five types of energy. Three cycles show how these elements interact and how the energies alter and change between the Five Elements. The Productive Cycle is a positive transformation of the energies and is sometimes known as the forward cycle. In this cycle, the Five Elements interact harmoniously with each other and grow and expand the energies within. In the Productive Cycle, Wood creates Fire and Fire in turn burns substance into ash, producing Earth. From the Earth comes Metal, in the form of minerals. Metal, through condensation, attracts Water, which in turn, nourishes and grows Wood. In the Controlling Cycle, Water extinguishes or controls Fire. Fire in turn, melts or controls Metal. Metal cuts Wood, thus it controls Wood. Wood in the form of the roots of plants can break the Earth, and thus Wood controls Earth. Earth borders and holds in Water, thus, Water is controlled by Earth. 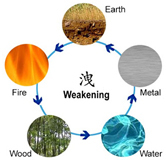 The Weakening Cycle involves an element draining the energies of the element that produces it. This transformation is not a forceful or aggressive process, it is a natural transformation of energies through phases. In the Weakening Cycle, Wood is nourished by Water. Thus Wood weakens Water. Metal is weakened by Water because Metal produces water. Earth must be broken up and mined to produce minerals (Metal), thus in the process Earth is weakened. So, Metal weakens Earth. Fire produces earth, but too much Earth will put out the Fire. Finally, Wood is burnt to make Fire thus Fire weakens Wood. Everything has a purpose. There are times when we want to use a Controlling Cycle. The three cycles help with the understanding of the application of theories in Feng Shui.